Subterranean search and rescue underway. The Rocketry Division of the University of Toronto Aerospace Team set out Saturday at the crack of dawn to upstate New York for their second launch attempt of the 2016-17 academic year. This launch was the culmination of two years of development for a hybrid sounding rocket set to compete in the Intercollegiate Rocket Engineering Competition (IREC) hosted this past June in New Mexico. The rocket, DELIVERANCE II, was designed to generate approximately 18,000 Newton-Seconds of total impulse and travel to an altitude of 23,000 ft. Sounding rockets like DELIVERANCE II launch in relatively low arcs within the atmosphere to collect scientific data, specifically taking advantage of the environment of a sounding rocket’s flight. The team’s hybrid rocket is unlike a typical solid rocket in that it contains two different types of propellant: an oxidizing liquid (nitrous oxide) and solid fuel (paraffin wax). 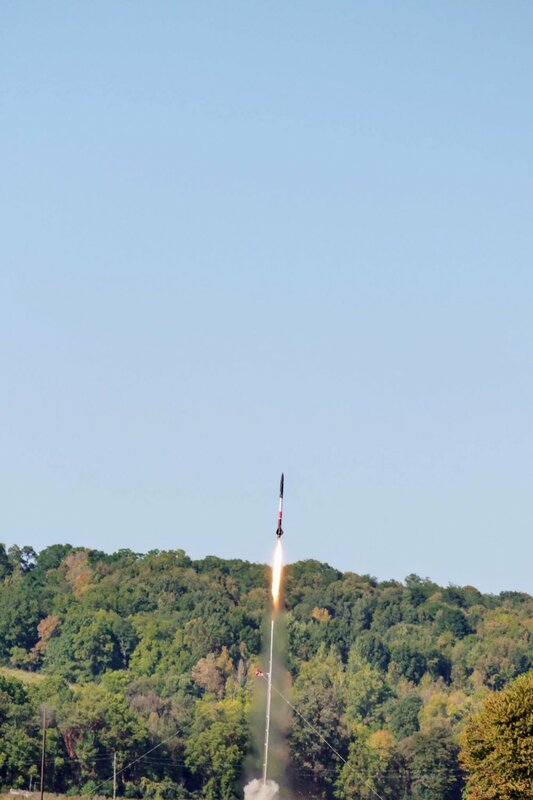 The September 23rd launch was sponsored by the Upstate Research Rocketry Group (URRG) at Torrey Farms of Potter, NY. This opportunity enabled the Rocketry Division to test the entire rocket system in flight and use of ground support equipment in the field, unlike regular tests which only evaluate thrust on a stationary test stand. Saturday was the perfect day for rocketry. At noon, with a clear sky and low winds, DELIVERANCE II was raised to the launch rail, the area was cleared for launch, the rocket was fully loaded with nitrous oxide at 700 psi of pressure, and finally DELIVERANCE II was armed for take-off. Following a five second countdown a plume of white smoke billowed from DELIVERANCE II, standing ten feet high on its rail. Suddenly the rocket vanished, soaring into the sky, accelerating to its maximum velocity in 3 seconds. Sounding rockets, unlike conventional rockets, don’t constantly burn propellant. Upon reaching maximum velocity, and only a fraction of the way into its climb, DELIVERANCE II finished its burn. It then coasted up to the apex of its flight, decelerating under the force of gravity. This flight of DELIVERANCE II lasted 45 seconds. At the apex of the flight the recovery system failed to deploy, meaning no parachute was released, and DELIVERANCE II continued its arc back down to the ground. At the end of the rocket’s flight it buried itself in a nearby field, impacting at over 700 kilometers per hour. While video recording showed the general area of landing, after a day and a half of coordinated search efforts DELIVERANCE II has not been found. The team plans to return to the area to continue the search when conditions in the fields are more favourable. Although the recovery system failed to deploy, the Rocketry Division is excited by the result. This launch was the first successful firing of a hybrid rocket in real-world conditions by the University of Toronto Aerospace Team. In this respect, two years of laborious effort and dedication on the part of the Rocketry Division have paid off. Footage and data are being reviewed to determine the cause of the system failure, and the learnings from this launch will be incorporated into the next design. While finding DELIVERANCE II would be valuable to analyze the in-flight data recordings, with or without, the Rocketry Division’s next rocket will stand on years of data and learning to reach new heights.